Hello everyone ! Thanks a ton for the birthday wishes !! I had a great day (but a busy one !) I wasn't sure what to treat myself with on my birthday until I talked to Sunitha :-) Thanks a lot buddy ! She convinced me it has to be payasam especially since we do not have one on our blog. Either ways, for all the four birthdays at home I make this payasam, 99 % ! This is a favorite and even the lil imp will finish off a bowl full. There is one more reason for sharing this sweet dish with you..Our site has crossed 10K hits in less than 4 months. We can't tell you how happy we are.Thanks for the support and encouragement. I have made this umpteen times, but this is the first time that I measured each and every ingredient,wanting to share it with you. My recipe is slightly different from what I have seen around and I hope you will love it as much as my family and I do . 1.Heat 2 Tsp ghee in a deep and thick bottom pan.Throw in the vermicelli anf fry till it is golden brown in color. 2. Pour in 1 1/2 cups of milk and 1/2 cup of water and allow to boil. 3.Lower the heat and let the vermicelli get cooked well.Stir in between. It takes almost 10-12 minutes. 4.By this time almost all the water content will be dried, do not add more water or milk at this point. 5.Add sugar and start stirring continuously, on low heat.Continue this till all the water gets evaporated and the mixture gets thickened.While stirring if you are able to see the path of the spoon/spatula without the mixture running over there immediately, it is done. This takes ~10- 12 minutes on medium low heat. 6.Slowly add the milk into it. The point is that the boiling shouldn't get stopped while you pour the cold milk.This can be done on high heat and stirring continuously, while you add around 1/3 cup of milk at a time. 7.Once you added the milk, it should be boiled well.Pour more milk to get the desired consistency.Add the cardamom powder. Switch off the heat. 8.Heat 2 tsp ghee ina pan and fry the cahsews and raisins till golden brown, one after the other and garnish the payasam with this. Serve warm or cold. 1.The sugar I've used will give you a moderately sweet payasam, you may add if you want your payasam more sweeter. 2.You may have to add more milk to get a desired consistency, if you are serving it later. Semiya gets thickened as it cools down. 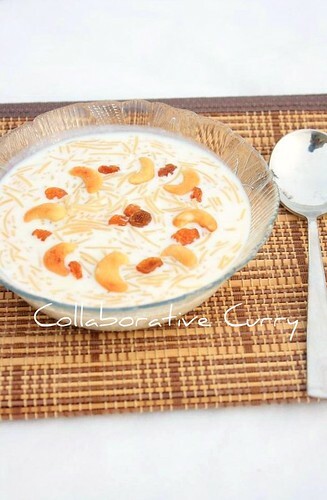 Payasam looks very nice..specially those beautifully roasted cashew. Payasam looks yummmm....My kids fav :). Great way to celebrate ur birthday with this great dish - ur Semiya looks awesome and delicious.I make this a lot at my place too..Also congratulations, Sunitha and Namitha on ur site crossing the 10k hits in less than 4 mths. Now that too calls for celebration.!!!. Such a nice sweet treat, perfect for the celebration! Perfect for the ocassion, Happy birthday ! am late but still wish you a very Happy birthday! thats one my favorite payasam recipe. it looks so creamy and yummy. love it. Hope u had a gr8 time on ur Bday Dear!! Kheer looks perfect! n 10k hits in 4 months is simply awesome :) Congratulations to both of u!! What a perfect picture...great presentation. Aha!!!!!!!!!!!!!!!! I want to have the whole bowl of payasam right away. I've never had payasm, it looks delicious! Payasam looks great....Did you miss the quantity of sugar to be added? Beautiful payasam! Hope u had a fun filled day! Payasam looks rich and beautiful.. It looks wonderful, thanks for sharing your special recipe! I usually don't measure either with my standby recipes. It's hard to think about measuring to write it down for your blog! Happy to hear you had a nice birthday!! Happy belated birthday and congrats on the 10K hits! That is awesome. This dessert looks like the perfect birthday treat. Kind of like rice pudding. Delicious! This recipe looks awesome ,we make a gujarati dish similar called dhudh pak. This has got to be good. I must follow you now! Think you for the recipe. Wish You a Many Many Happy Returns of the day Namita!! Kheer! I'll lap up the bowl immediately! It's wondrous! I never try to use Vermicelli cook sweet soup before, this look interesting. yUMMY KHEER!! !lOVE TO HAVE THAT BOWL NOW ITSELF. Payasam looks perfect and yummy. Belated Birthday wishes. Payasam looks very tempting. 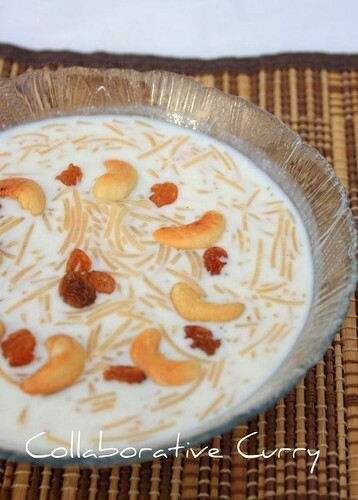 Yummy Kheer, good for every celebration. Happy belated Birthday, enjoy. Congrats on the big numbers. That's awesome! What a lovely & appetizing dish!! I have never eaten it before, but that is now going to change,..
Belated Happy B'day. Hope you had a wonderful day and wish you a wonderful year a head. Congrats on the big number too ! Belated bday wishes. 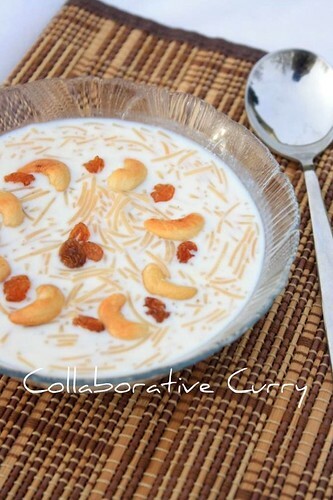 Kheer sounds divine. That looks simple and beautiful! This is my favourite payasam too..Kothiyavunu. congrats for such a great response..love the presentation..my all time favorite dessert.. I would love a bowl of payasm right now!!! Happy Belated Birthday! Your dessert looks oh so good, I've never tried it before but I know for sure I'll love it, the recipe sounds so delicious, Mmmm!! !